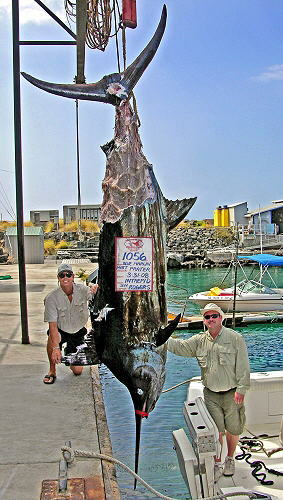 Home | Browse | United States | Hawaii | Kona | Kona Hawaii Fishing Report - May wrap-up. 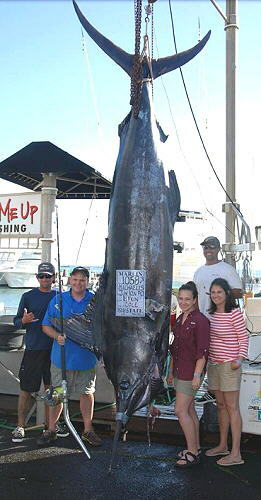 Kona Hawaii fishing report � May wrap-up. The number of "Grander" marlins caught in the world in 2015 now stands at three and all three were caught in Hawaii. 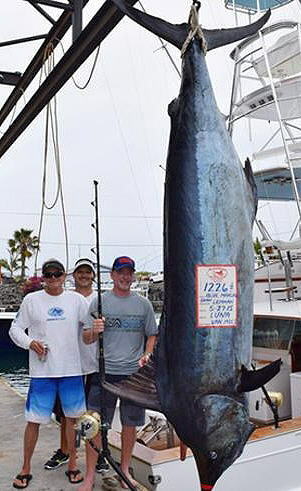 Kona kicked it off with the first grander back in February and just this week, one grander was caught in Maui and another in Kona two days later. The first two granders of the year just happened to both weigh in at 1058 lbs. but grander number three topped the scales at 1226.5 lbs. Only 20% of the grander marlins landed weigh 1200 or more pounds. As I sit here and look at the picture on my wall of my own grander catch, I can't help but feel ripped off from being in that 20%. After we caught our grander marlin and were attempting to get it in the boat, three oceanic white tip sharks weighing about 250 lbs. each showed up and started tearing chunks off of our marlin. We were in a tug-of-war and lost close to 200 lbs. of meat off of our marlin in less than one minute. Putting the boat in gear and getting us moving was the only way to stop the carnage. The sharks followed us all the way to the harbor but they are slow swimmers so they couldn't catch up to us to take any more bites. At the harbor entrance, another boat noticed our predicament and ran over the top of the sharks scaring them away. If not, they probably would have gone straight into the harbor with us. We see marine life of all kinds swimming in our harbor. Tiger sharks weighing over 1000 lbs. are a fairly common site. 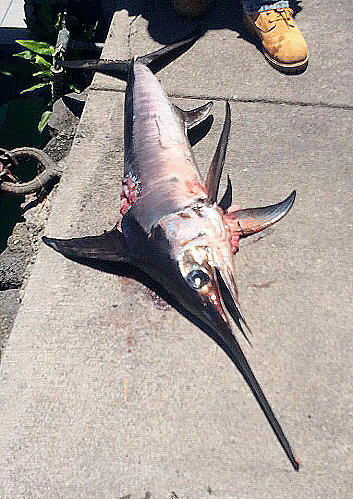 Yesterday, a real strange site, a broadbill swordfish had found its way into the harbor. Broadbill live in the dark depths and usually only come near the surface at night. I had left the harbor only minutes before it was spotted and had said my goodbyes to a couple of other captains that were there. One of them being Captain Randy Llanes. It was less than a month ago that we had a huge barracuda swimming under our boats and Randy tried to catch it but it wouldn't bite. Randy mentioned that he wished he had his spear gun on his boat. Well, this time Randy did have his spear gun and decided to jump in the water and spear the broadbill. He speared the broadbill and then the broadbill turned and speared him. Right in the chest, killing Randy almost instantly. Randy and I have been harbor neighbors and friends for many years. I'm going to miss him a lot. Ono tops the list of the most common catch for the month. The marlin bite was pretty good but the spearfish bite was even better. May is when more yellowfin tuna weighing 100+ lbs. start showing up and they have. The FAD's and the farm buoy have been producing yellowfin and bigeye tuna ranging from just a few pounds to 30+. With the trolling bite being so good lately I didn't even attempt to do any bottom fishing this month. I mostly catch sharks while bottom fishing anyway so unless I get someone on a charter that really wants to catch and release a shark, I don't see any reason to bottom fish for a while.